Holly, tell us about you and your business! I’m the owner + creative director of Holly Meyer Design, a boutique studio specializing in helping wholehearted solopreneurs and small creative businesses get clear on their brand identity + message through intentional branding, web design and coaching. I’ve been designing most of my life and graduated with a four-year degree in graphic design. It wasn’t until 2013 that I decided to start my own design business. In 2014 I legalized my business and in 2016 I took a leap of faith and left my full-time job at an advertising agency to continue pursuing Holly Meyer Design! What was your design process like before taking the course? I thought my design process was solid since I already had several years experience working on different design teams, and most recently at an advertising agency where I worked on multiple client projects at once. However, while stepping out on my own and learning to become my own project manager, I quickly realized that I needed to organize and streamline my process even further so I could deliver the best projects possible for my clients and have more availability to take on additional clients or other passion projects. Did you have any hesitations before enrolling in O&A? What made you decide to enroll? I hesitated signing up for the course because I know that every designer works differently and I wasn’t sure if the processes shared in O&A would be something I’d want to implement myself. I watched Nesha's webinar leading up to the course and learned lots of tips in just one hour that I wasn’t taking advantage of in my workflow. I thought the webinar would be enough for me, but shortly after it I started to book more design projects and knew I needed more help restructuring my systems so I could better manage my client projects. And what’s better than learning from another designer + business owner? What were the concrete results you achieved from taking O&A? It opened my eyes to ways that I can continue to refine my process with onboarding, designing, handing off design files and receiving testimonials. I learned and experienced that it’s beneficial to have a defined process outlined in something like Asana so my clients are educated about each step of the project and feel confident that they’re in good hands. I also really enjoy the community aspect of the course (the private Facebook group). Since the group is filled with other web & graphic designers, I’m able to ask any questions I have and get incredible feedback from people who understand what it is I do. What do your clients think about your newly streamlined process? After watching one of the course modules, I did what you suggested and started using Acuity Scheduling to set up consultations and host office hours and training calls. My clients love the ease of picking a day and time that works for them and it saves us from emailing back and forth trying to nail down a date. What was your favourite module in O&A? It’s so difficult for me to pick one favorite module! I’ve learned something new in each one. If I had to pick just one, it’d be the module that discusses project management + mapping out your design process because that’s the biggest area I struggled with prior to the course. What was your biggest takeaway from the course? Since taking the course, I’ve learned new ways to organize + automate my design process and client work. It even sparked some ideas of things I can implement in my process that weren’t covered in the course. I’m excited about refining my systems so I can better serve my clients and continue to deliver projects they love. How important do you think a streamlined design process is? I’m realizing that a streamlined design process is extremely important. When you’re not organized, your client can easily pick up on that. Having a solid system in place saves time and helps you and your client work together as efficiently as possible. Holly was hesitant to enroll in Organize & Automate because she knows every designer works differently and wasn’t sure if the way I worked would suit her. 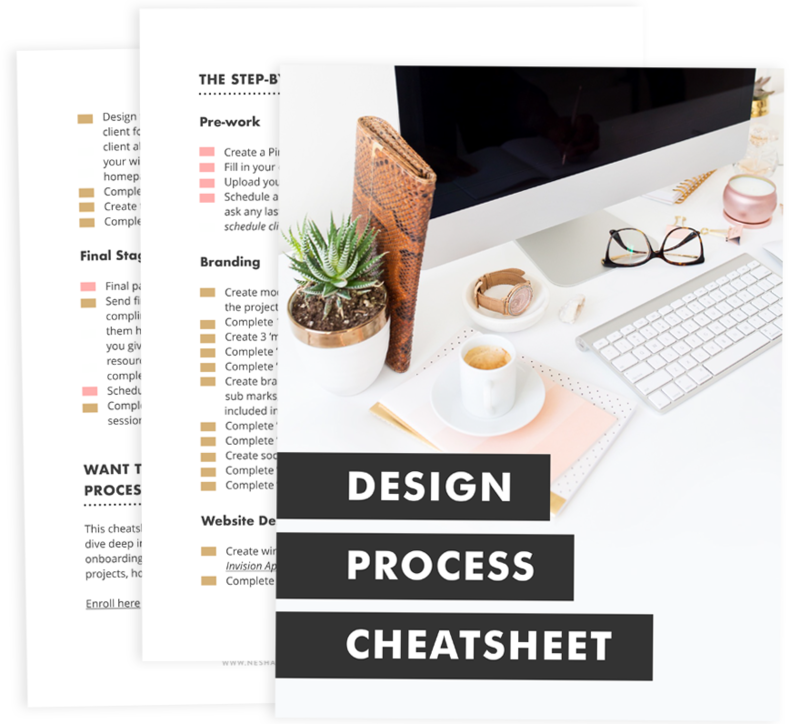 But, after she started booking more and more clients, she realized she urgently needed more help streamlining her design process if she was going to continue growing without getting burned out. She realized that learning from another designer's systems and processes was the best and fastest approach to improving her own process. When you’re not organized, your client can easily pick up on that. You should make sure your clients have the best experience possible when they're working with you so they'll come back for more work or refer others to you! Holly Meyer is a student of my signature course, Organize & Automate, made to help brand + web designers streamline their design process so they can work faster and smarter, not harder.